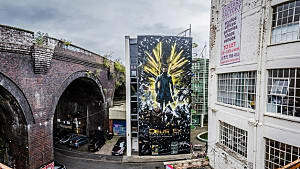 Deus Ex: Mankind Divided continues the story of the world inhabited by mechanically augmented citizens. 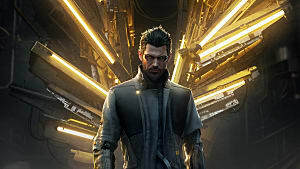 The events take place two years after the Aug Incident from the previous installment of the game, titled Human Revolution, and features the return of Adam Jensen, an Interpol officer and the game’s protagonist. The game will be released worldwide on August 23, 2016 for PC, PS4 and Xbox One. 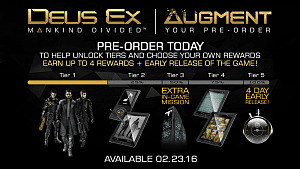 The distribution includes four different versions for each platform: Day One Edition, Digital Standard Edition, Digital Deluxe Edition, and Collector’s Edition. Let’s take a look at all four options and see which one is the best for you. 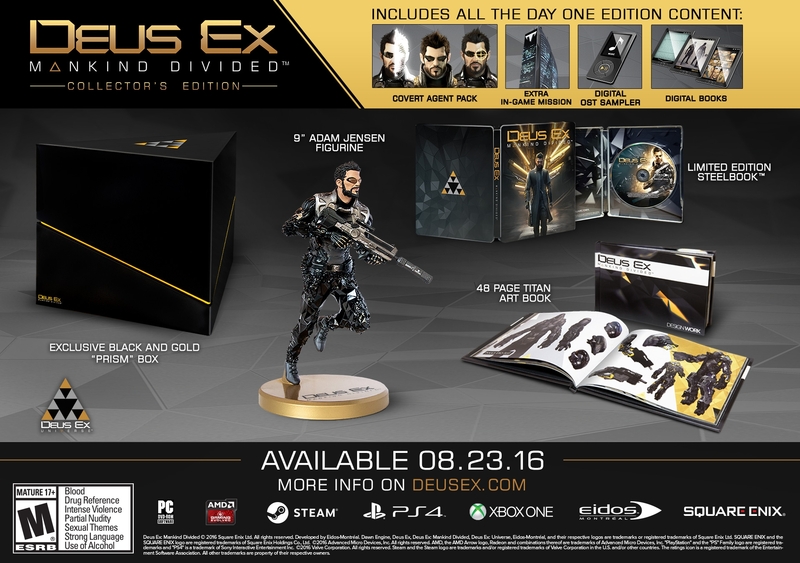 Deus Ex: Mankind Divided Collector’s Edition is the ultimate edition of the game, which combines all other available editions and adds some cool bonus items. This edition is made for the true fans of the game. Exclusive black and gold "Prism" box. 9” Adam Jensen Figurine that showcases his Titan Shield augmentation in action. 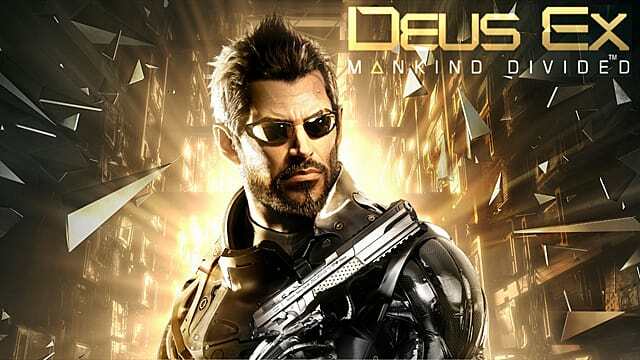 Physical 48 Page Titan Art Book demonstrating the incredible art of Deus Ex environments and weaponry. Limited Edition Steelbook that draws parallels between the game’s protagonist and a mythical Greek hero – Icarus. On top of that, you get a whole set of digital additional content that is also available in the Day One Edition: Covert Agent Pack, Digital OST Sampler, Extra In-Game Mission, and Digital Books. Intruder Gear. If you prefer to take the silent route, the Intruder gear provides you with custom skinned versions of Adam’s trench coat and Pistol from Deus Ex: Mankind Divided. Become a ghost in the wind, sneaking past any obstacle without so much as a glance in your direction. Enforcer Gear. Just want to power your way through your opponents? The Enforcer gear contains custom skinned versions of Adam’s Combat Armor and Combat Rifle from Deus Ex: Mankind Divided. This pack will help to get you out of a tight spot, leaving only bullet holes in the wake of your onslaught. Classic Gear. Go back to your roots with the Classic gear, granting you in-game access to Adam’s iconic Combat Armor, Trench Coat, and Revolver from Deus Ex: Human Revolution. No matter the path you choose, you’ll be sure to turn a few heads with your unparalleled style. Digital OST Sampler - Composed by Michael McCann. The new mission, titled "Desperate Measures," takes place in Prague. 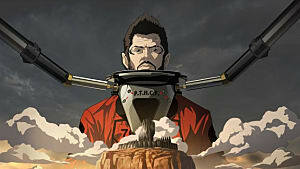 Adam Jensen returns to the epicenter of the Ruzicka train station explosion that shattered the city of Prague recently. Your task is to investigate the people behind the attack and their motives. You will be able to use your augmentations and skills as a covert operative in order to unveil the evil culprit responsible for the bombing. 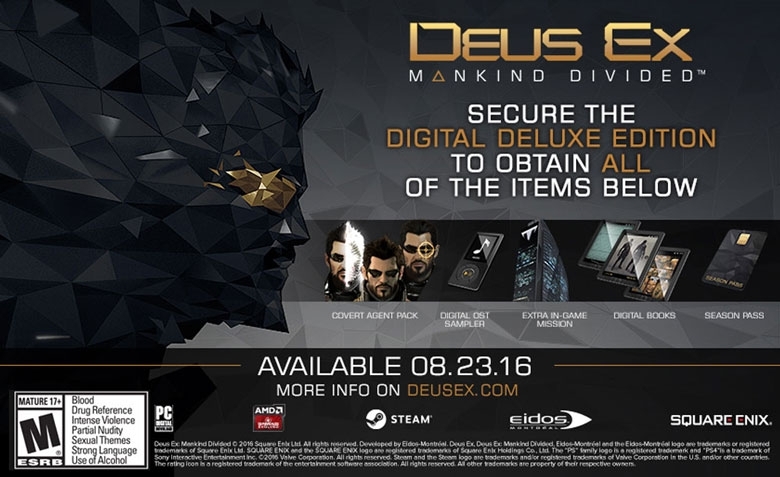 Deus Ex: Mankind Divided Day One Edition besides the game also includes all the additional digital content, such as Covert Agent Pack, Digital OST Sampler, Extra In-Game Mission, and Digital Books (see the descriptions above). This special edition is designed for fans who want to play the game as early as possible, hence the Day One tag. 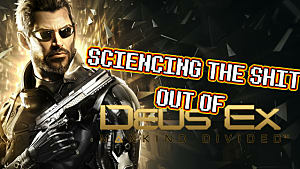 It includes all the additional digital content, which grants you a full Deus Ex experience on the very first day of release. 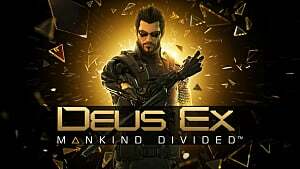 Deus Ex: Mankind Divided Digital Deluxe Edition is the digital replica of Day One Edition (Covert Agent Pack, Digital OST Sampler, Extra In-Game Mission, and Digital Books) with an addition of Season Pass that grants you access to DLCs that will be gradually released in the coming months. The additional content offered in the Season Pass includes not only the narrative expansions of the game’s lore, but also various new items and features that may significantly boost your gameplay experience. 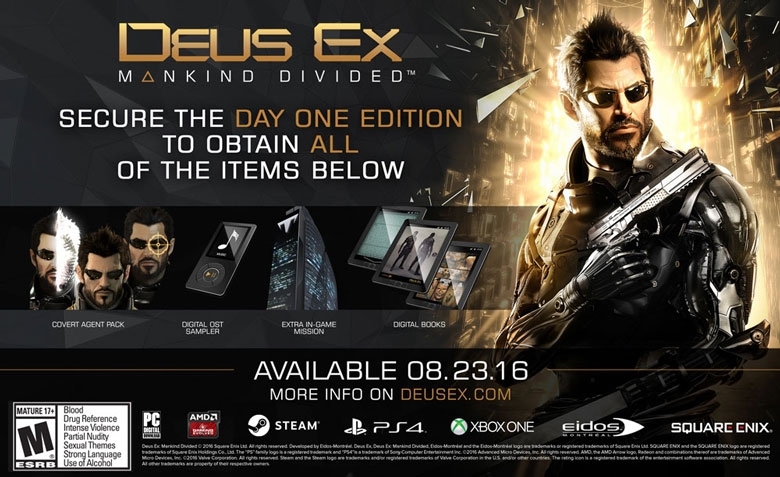 Deus Ex: Mankind Divided Digital Standard Edition is a digital variant of the Day One Edition (Covert Agent Pack, Digital OST Sampler, Extra In-Game Mission, and Digital Books). The advantage of the Digital version is that you are guaranteed to be able to download and play the game at the day of release. 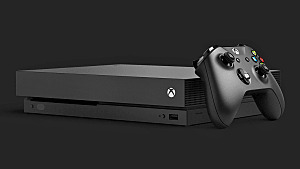 While the physical Day One Edition may not arrive at the day of release and you will have to wait. However, the physical copy is a valuable collector’s item. 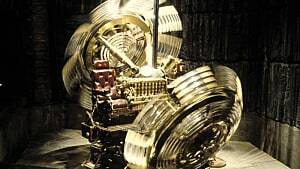 So, if you want to play the game as soon as possible, then buy the Digital Standard Edition. And, if you are ready to wait for a day or two, but would like to have a physical copy of the game with that Day One label, then buy the Day One Edition. Additionally, all owners of any of the four versions will gain free access to the new live game mode – Breach. It greatly differs from the original game, and is closer to arcade puzzle approach than the stealth shooter of the main game. In Breach you take on a role of a hacker who uses his skills to breach the most highly secured facilities in the world to obtain valuable data and assets. The difficulty level increases progressively, so every new discovery and every additional XP point will help you progress through the game. 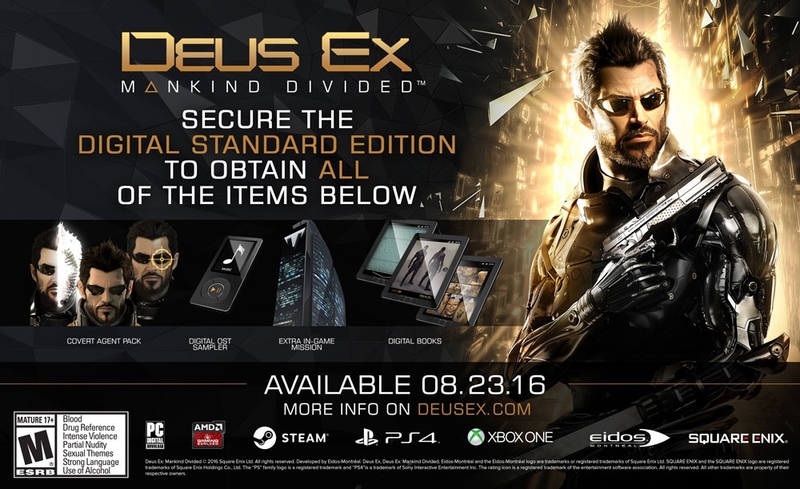 Do you plan on purchasing the Deus Ex: Mankind Divided Collector's Edition with all those extra features? Let us know in the comments section below.